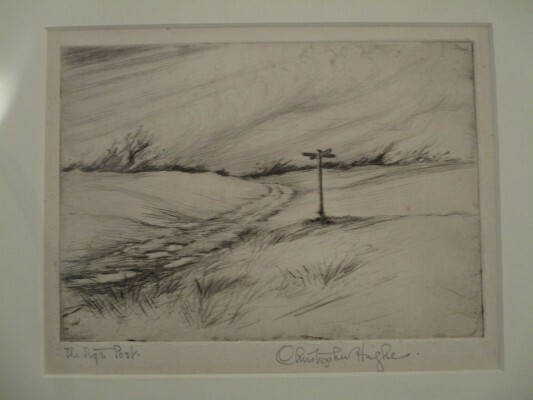 Inspired by a John Piper lithograph of Long Street in Devizes found online, Kate Freeman joined forces with Marlborough Open Studios and Wiltshire Museum to collate this very special little exhibition of hitherto unseen pieces from Wiltshire artists of the past and present. Those of us moved to seek out these delights were able to view the work of Ravilious, Tanner, Piper, Moore, Arnold, Inshaw and others as well as the paintings and etchings of the less well known. Some pieces, such as the drawing of Wolf Hall, made no pretence at great art but intrigued as glimpses in to our rural past. A portrait by Thomas Lawrence left no significant impression but information that it had been painted at age 15 shed light on the start of the artist’s journey, and the dark painting of the execution of Rebecca Smith was brought to life with the knowledge that ghouls from miles around flocked to feed on her pain. There were variations on theme of Avebury stones and wind blown barrows, and opportunities to identify lost locations. The works were gleaned from the BBC website, an illustrated catalogue and the museum’s archives. David Inshaw had loaned several of his works including the recent ‘Cerne Abbas Giant lll’, a different view of a classic image, haunted by ravens, and Couple Dancing, a moment of spontaneous affection observed by seagulls; light streamed through John Piper’s stained glass window and quirk peeked from his lithographs; there was the Ravilious ‘Boat Race Day’ bowl, from a private collection, which shone with a glint of Grayson Perry; Henry Grant captured a ‘Bustard’, Henry Moore took us ‘Inside the Circle’ and Robin Tanner over ‘The Meadow Stile’. For those of us who respond to art instinctively and emotionally rather than with an academic eye it is our immediate response to a work that matters. The curator and I both particularly enjoyed ‘The Duke’s Vaunt’, a pen and watercolour view by John Stone, a little known artist, of an ancient tree in Savernake Forest that at one point could embrace within its trunk twenty school boys and a small musical band; and ‘The Sign-post’, an 1930 etching by a former Art Master at Marlborough College that delicately depicts a lonely crossroads somewhere on the Plain. Works from the cabinets will be returned to the archives this week but work on the walls will remain a while. If you blinked you may have missed this, so keep your eyes open for Art, in Wiltshire and beyond, and enjoy the knowledge, inspiration and sheer delight it brings. Marlborough Open Studios continues through July. In Oxford today I wept for my own folly. Then I dried my eyes and wrote this. For it is never too late to create.